Whether it’s red, dry, or itchy, a rash around the eyes can be highly disconcerting and disruptive to your daily life. Since an eye rash is a very specific symptom, it usually indicates one of a small handful of possible culprits. As with most forms of skin irritation or inflammation, the problem may just be allergies or a similar irritant. An eye rash could also indicate a condition such as dermatitis or eczema. The worst case, of course, is a viral or bacterial infection. Given how the severity of each cause can vary, it’s important to arm yourself with information so that you don’t overestimate (or underestimate) what your eye rash might be from. What Causes a Rash around the Eyes? Eczema on face or around the eyes is not the most common way this skin condition presents itself, but it’s far from unheard of. As a chronic condition, eczema can wax and wane over time and sufferers can experience periodic flare-ups or even perpetual but mild symptoms. Eczema is a form of localized skin irritation that is characterized by dryness, redness, peeling, hardening, breaking, and possible bleeding of the skin. There is some evidence that atopic dermatitis can be worsened during periods of emotional disturbance such as high stress or anger. Although often associated with hay fever (allergic rhinitis), other forms of allergy can also cause an itchy or red rash around the eyes. In addition to dander, insect bites, or things like poison ivy or oak, various food allergies can also make a rash emerge. In these cases, you may get a rash around your eyes and mouth. Allergic reactions tend to come with dry or watery eyes, puffy (i.e., swollen and/or inflamed) skin at the site of the rash, itchiness, and possibly raised and itchy bumps (hives). One of the key differences between an allergic reaction and contact dermatitis is that, with an allergy, the symptoms don’t have to appear where the allergen makes contact. With contact dermatitis, however, the rash always manifests around the part of the skin that was in contact with the offending irritant. Since people do not normally allow foreign substances near their eyes, most contact dermatitis-related eye rashes are from cosmetics, soaps, sunscreen, mascara, facial washes, exfoliating scrubs, moisturizing creams, or similar products. Old cosmetic products can also go bad and start to harbor bacteria or fungi that can then be deposited on or near your eye when used. Contact dermatitis causes redness, irritation, and inflammation, much like an allergy, but is usually more localized around the trigger. Although one of the less common causes, Lyme disease is known to cause a rash that can sometimes appear around the eyes. Lyme disease is spread primarily by bacteria transmitted through tick bites and presents with an itchy rash, fever, headache, fatigue, and nervous system impairment. Swimming goggles and snorkel masks can be a cause of a rash around the eyes, especially in children. If the goggles or mask are worn too tightly, the rubber will irritate the skin and provoke a short-lived reaction from the skin. Yes, eye herpes can actually happen. Specifically, this is a result of herpes simplex type 1—the variety that causes cold sores. When it infects the eye, herpes tends to produce redness, excessive tear production, cloudiness, and a painful rash around the area. Eye herpes is usually the result of something like a contaminated contact lens, but you could theoretically also get it if someone with a cold sore kissed your eye. If you don’t wash your hands or contact lenses properly, it can be possible to inadvertently infect yourself with minor bacteria. This results in redness and swelling around the eye but not usually more than that. However, of particular concern is cellulitis, a skin infection caused by staph or strep bacteria. Cellulitis results in a growing red rash and swelling that feels warm to the touch and can come with fever, chills, general fatigue, and possibly the development of abscesses. Cellulitis should always be brought to a doctor’s attention as soon as possible since it can potentially develop into a blood infection. Certain autoimmune conditions, such as systemic lupus, can cause skin effects including the telltale “butterfly” rash under the eyes and across the nose and cheeks. An autoimmune disorder is when parts of immune system attack normal parts of your body, usually a specific tissue type or location. Autoimmune disorders rarely cause only a rash and can be experienced alongside symptoms like muscle pain, fever, or unexplained weight loss. Although it’s usually obvious if you have an eye rash, finding out what kind of rash can take some investigation. Is the eye itself being affected? Eczema doesn’t affect the eyeball and contact dermatitis shouldn’t normally affect it either. If your eyes are getting red or watery, then it may be an allergy or herpes. Are there any circumstances that tend to occur around the time the rash appears? Perhaps you went swimming, cuddled a pet, or walked outdoors through a garden? Do you have a fever? Allergies and eczema don’t cause fevers and neither does contact dermatitis. Do you have any muscle or joint pain? Did you recently begin using a new brand of soap, facial product, sunscreen, or similar product? How does the affected skin feel? Is it bumpy, dry, flaky, peeling, or bleeding? Does your eye hurt? A painful rash suggests viral or bacterial causes. Does the rash appear to be spreading or is it warm to the touch? This can indicate cellulitis will need medical attention. Are the eyelashes affected (i.e., crusts, falling out)? Allergies are more likely to involve eyelashes than other causes. Do you use any facial products? If so, how old are they? Generally speaking, natural methods are ineffective against viral or bacterial culprits when it comes to eye rashes. If you show signs of an infection, and especially if you show signs of cellulitis, it’s important to seek your doctor’s advice. That said, for benign causes of an eye rash, the following remedies can be employed. This is a standard home remedy for dealing with inflammation or swelling. Take a clean towel or cloth and use it to wrap up a few ice cubes. Place the ice gently against the closed eye. Make sure not to press down on the ice or to let it make direct contact with your skin. Incidentally, a bag of frozen peas can substitute for the ice cubes. Leave the cubes (or peas) in place for no more than 10 minutes at a time. Saline is a salt water solution meant to mimic your body’s normal fluids. Saline eye drops may help moisturize your eyes if they start to become too dry due to whatever is causing the rash. Since saline is also used as artificial tears, they may be able to help clear out any irritants from your eyes if they have been too dry to do so normally. Take a cucumber and cut it into thick slices. 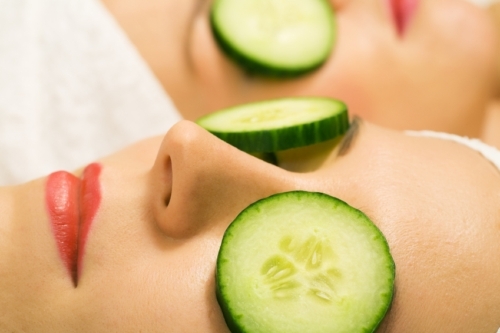 Soak the slices in cold water and then apply one slice to each eye with the lid closed. Let the cucumber sit and moisturize and cool the area until the slices start to warm up. At this point, discard them and use another set. Repeat until all of the cucumber is used up. Eczema can be aggravated by dry air, particularly during the winter. Using a humidifier can restore moisture to the air and help alleviate any ongoing agitation. When dealing with an allergic reaction or contact dermatitis, removing as much of the allergen from your skin as possible is an important treatment step. Baby shampoo is good for cleaning skin and is also gentle on the eyes, so it works well for this purpose. Take a clean cotton cloth and soak it in baby shampoo, then gently cleanse the affected area. Aloe vera is known to reduce inflammation and the plant’s pulp can be used to help treat an eye rash. Mix the aloe vera pulp with cold water then soak a cotton ball in the solution. Place the ball on the closed eye and let it sit until the cotton dries. Odd as it sounds, a potato is actually a surprisingly good poultice due to how it retains moisture. Grate a potato so the interior is exposed and place it on your eye for no more than 15 minutes. On a minor note, you should also be prepared to get some odd looks as you hold a potato against your face, as well as some groaner puns. Minimizing aggravation is important to speed up the healing of your eye rash. This means resisting the urge to rub at your eyes and minimizing exposure to other possible irritants like smoke, pollen, dander, or other allergens if that is the cause. Preventing an eye rash is mostly a case of keeping the skin moisturized while avoiding possible triggers and irritants. If you use contact lenses, be sure to clean them properly each night and change the lens solution regularly. If you use any facial products like mascara, consider throwing them out if they are too old or at the very least avoid using them for a few days and see if the rash clears up. If you have allergies, taking an antihistamine or employing other steps to avoid attacks can go a long way to keeping your eyes in the clear. Lastly, refrain from rubbing at your eyes or at least wash your hands before doing so. As mentioned earlier, one of the more serious causes of an eye rash is cellulitis. Although a primarily cosmetic problem, cellulitis always warrants special medical attention because of the danger staph and strep pose if they infiltrate deeper than the skin. If this happens, the bacteria can potentially trigger a case of septicemia, also known as blood poisoning. This occurs when the bacteria is able to freely circulate through the bloodstream and wreak havoc. The other risk is sepsis, a full-body inflammation response that can become fatal very quickly if medical intervention isn’t provided. In addition, if you develop a fever and you have a known case of cellulitis, seek medical attention immediately. The rash hurts or itches enough to become unbearable or otherwise disruptive (such as interfering with sleep). The cornea appears to be swelling. There is no sign of improvement with home remedies after a few days. The rash seems to be recurrent. You feel a burning sensation from the rash.